Our first sight of this captivating bush with variegated leaves was during our vacation to Felda Residence in Sungkai several decades ago! What caught our attention were the whitish flowers and small round blackish berries that sat comfortably on the beautiful variegated leaves. A rare tropical plant to be added to one’s garden. Fortunately, I went through my photo archive and chanced upon this beauty again. What an opportunity to write about it! Botanical Name: Osmoxylon lineare ‘Variegata’ (syn. : Boerlagiodendron lineare). Common Names: Variegated Miagos Bush, Green Aralia. Etymology: The genus name Osmoxylon is derived from a combination of two Greek words osme, meaning scent and xylon, meaning wood. The species name lineare is the Latin adjective, linearis, referring to the linear lobes of the leaves. Origin: Native to Southeast Asia and Philippines. ‘Variegata’ is a cultivar. 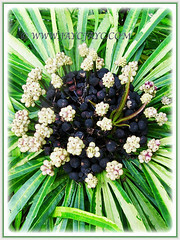 Features: Osmoxylon lineare is a species of the genus Osmoxylon that comprises of about 60 species of flowering plants. ‘Variegata’ is a showy cultivar. A slow-growing, small perennial bush or tree that reaches between 0.9 to 1.8 meter tall upon maturity and spread as wide. It has a pale grey stem with leaves arising in a spiral around the central stem. It produces palmate compound evergreen variegated leaves of green and white that have a leathery surface and are held on a 4-6 cm petiole. Small white to creamy coloured hermaphroditic flowers are produced in a dense head at the end of each stem. Eventually the flowers will ripen to develop into purple blackish seed-like berries. Culture (Care): Osmoxylon lineare ‘Variegata’ can be easily grown with minimum care. Light: Grows best in full sun but can tolerate full shade. Moisture: Moderate water needs. Water regularly and keep soil moist especially during the hot seasons. Allow soil to partially dry up before watering again. Soil: Best in sandy organic and loamy soils. 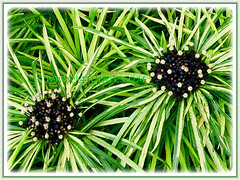 It can tolerate any commercial garden soil with good drainage. Others: Remove withered leaves. Provide adequate warmth and humidity. Feed once a month with a balanced liquid fertiliser. Generally free from pests or diseases. For subtropical and temperate regions: Hardiness: USDA Zone 10a – 11. 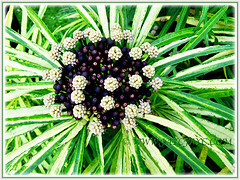 Osmoxylon lineare ‘Variegata’ can be grown as a perennial plant in container gardening, either outdoors or indoors. Temperatures close to 0°C are a short-lasting exception. It will start blooming from summer and continue to flower all year round. A repeat bloomer! Propagation: Easily by stem cuttings. Can also be propagated by seeds though plants grown from seed may not come true to parent. 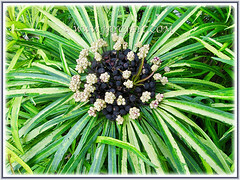 Usage: Osmoxylon lineare ‘Variegata’ is a rare and exotic tropical plant that’s excellent in any garden, especially if you desire a tropical theme. 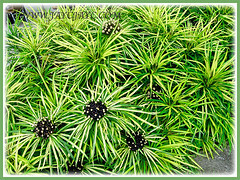 An ideal ornamental plant for container gardening or raised planters. 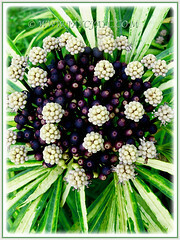 Grow this captivating plant to add colour and beauty to your garden beds or borders. Suitable too as a ground cover. amazing …. this is new to me, beautiful plant jackeline, blessings. Thank you dear Yara, Beautiful plant indeed! Have a blessed Friday and a wonderful weekend ahead.